Countries and peoples of modern times have often learned their history because their ancestors painstakingly recorded events, songs, poetry and religion. Burma is no exception. The earliest discovered Burma literature was found inscribed on stones called kyauksa which are still in existence. These carved ancient texts containing instructions on how to build a monastery or temple were written during the kingdom of Pagan and survived for millennia. There have been written literature pieces found on leaves of dried palms called peisa. The earliest written was in 1455 which was Yakhaing minthami eigyin, meaning Cradle Song of the Princess Arakan. There were also collections of traditions deciphered as Maniratanapumand some long poems on the life of Buddha called Hatthipala Pyo. These works of literature are heavily influenced by Indian and Thai. Literatures that are of religious nature and nonfiction were the prevailing genre. War poems composed by monarchs called kagyin were also popular. Buddhist monks played a big part in forming and expanding Burmese literature. Jataka are stories or depictions on the previous lives of Bodhisattva, both in animal and human form. Shin Maha Thilawuntha also wrote a narrative on the history of Buddhism. It is interesting to note that these very old writing were not limited to holy scripts but secular writing as well. Poetry on the 55 techniques on hairdressing was written by maid of honour named Yawei Shin Htwe. The style and form evolved as Burmese literature was influenced by the British when they were colonized in the 19th century. 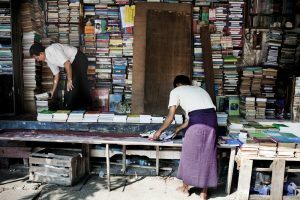 However, much of the traditional Burmese literature still flourished. It was during these times that a major milestone led by Theippan Maung Wa innovated a new form of literature called Hkit san. The arrival of printing presses spread Burmese’ literary culture such as monthly magazines and novels in serial instalments were published. Modern Burma saw the rise of notable authors. One of the more notable authors is Dr. Htin Aung who published definitive study on Burmese Folktales. Another poet and story writer U Zhin Kaw, whose autobiography on Burma in My Lifetime has enthralled his readers. The literary creation has become so popular that it can be found in American libraries. Despite several attempts at colonization, Burma has proudly held on to its roots and retained the stories of its ancestors in its ancestral form. It has evolved since the first writings were carved in stone but the spirit of its forefathers lives on.